Keep your loved one close to you with a beautiful piece of memorial jewelry from Milano Monuments. Our Religious Gift Center has hundreds of memorial jewelry items on display, including bracelets, necklaces, charms, earrings, gold cross pendants, gold crucifix pendants, charms of every kind, and Holy Spirit medals and rings. They are all made with the highest quality materials, including precious metals and stones, and many can be personalized with engravings of names, dates, inscriptions and even images. Let one of our memorial consultants show you all the beautiful memorial jewelry options available to you or for someone you plan on presenting with a touching gift of remembrance. 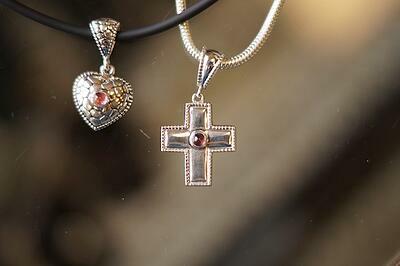 At Milano Monuments, we have a wide variety of memorial necklaces on display in our Gift Center. Choose from our beautiful collection of pre-engraved memorial jewelry with touching epitaphs, sayings and verses from the Bible. Or talk to one of our memorial jewelry designers about a custom-made, one-of-a-kind piece that you will treasure forever. Our memorial necklaces are made with highest quality sterling silver, gold and precious gemstones to ensure you can wear them with confidence and pride. Add a memorial charm or pendant and make the piece even more meaningful! See some examples of our beautiful memorial necklaces below. Memorial charms are a very personal and unique way to remember your loved one. You can add meaningful items to any memorial charm—photographs, memorabilia, gemstones—almost anything that brings back those beautiful memories of your times together. 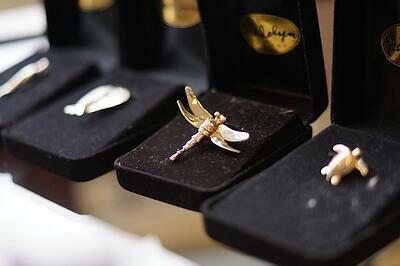 We have a wide variety of memorial charms and memorial jewelry to view in our Gift Center. Or you can discuss your ideas for an even more personalized memorial charm with one of our memorial designers. We can create charm memorial bracelets, charm memorial necklaces, pin charms, and more. We can even make charms that are hollowed out to hold cremation creating beautiful cremation jewelry. The possibilities are endless for a timeless memorial charm. At Milano Monuments, we have a beautiful assortment of memorial bracelets. They are made of the highest quality aluminum, stainless steel, gold or leather. Choose a memorial bracelet that you will wear wherever you may go and be a special reminder of one you love so much. Visit our Gift Center and ask one of our associates to show you our memorial bracelets, as well as our memorial jewelry.